The MiP Robotic Platform is the first self-balancing robot that you can drive, dance, plays games, battle with other MiPs, and that you can control via a compatible iOS or Android device. But did you know you can hack it? 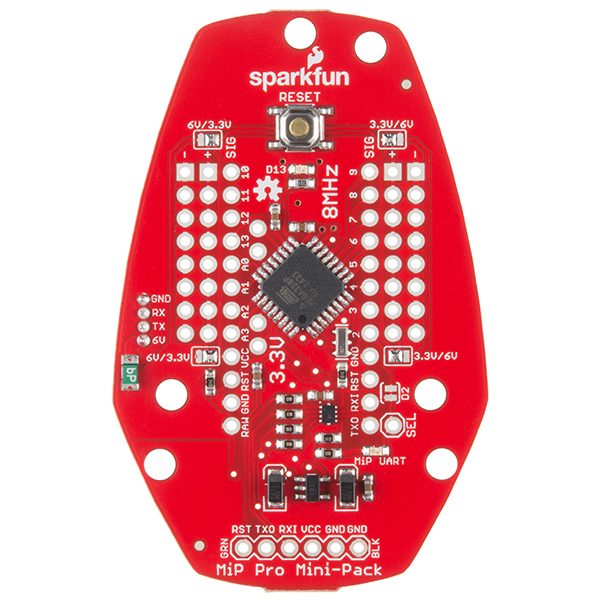 With the SparkFun ProMini-Pack you can access the robot's built-in hacking port to add increased functionality and a miniature Arduino to your MiP. All you will need to do to get this pack integrated into your MiP are a few simple hardware modifications to the robot's chassis. Once those modifications are complete you will have your very own ProMini attached to your MiP that you can start programing with your own code in no time flat! This is the same Pro Mini board you know and love, now in a form factor that allows it to be easily incorporated and secured into your MiP. Like the Arduino Pro Mini, the MiP ProMini-Pack utilizes SparkFun's minimal design approach to the Arduino platform while still only requiring 3.3V to power and running the 8MHz bootloader. The ProMini-Pack screws into the MiP's battery pack and gives the user a two small soldering areas and a 4-pin Expansion Socket that can, when used in conjunction with an Expansion Cable, be connected to the MiP's hacking port. 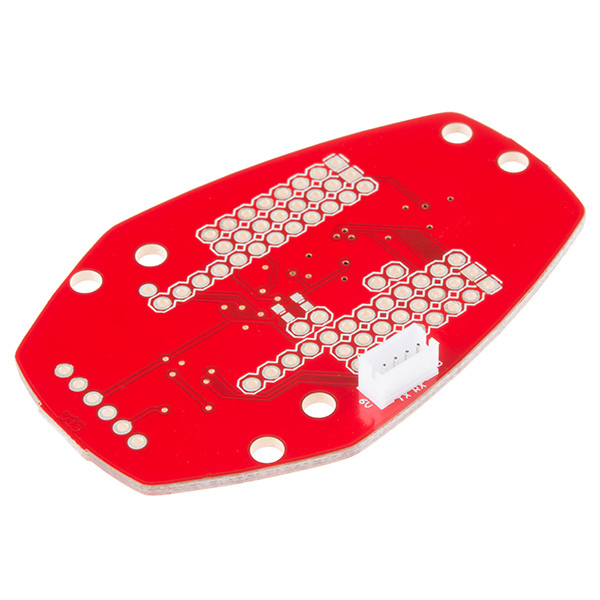 The hacking port that has been pre-soldered to the ProMini-Pack breaks out the following signals: GND (a ground connection to the battery on the MiP), RX (a 3.3v signal level UART receive pin), TX (a 3.3v signal level UART transmit pin), 6V (Raw battery power). I see this product is now retired. That's really too bad because this could have really opened up what the MiP can do. I've been banging my head against a local copy of Sparkfun's github library for this device. Is there anyone who can help implement the library? I see that a function to read data from the MiP has never been implemented. I've been trying on and off for the last couple years and can't seem to get it right. Has anyone out there written the code to do it? Or is the fact that the device is retired an indication that there are problems using it to read from the UART port? Hey all, I got the library up. there isn't much right now but I am working to clean up some documents I have been working with. 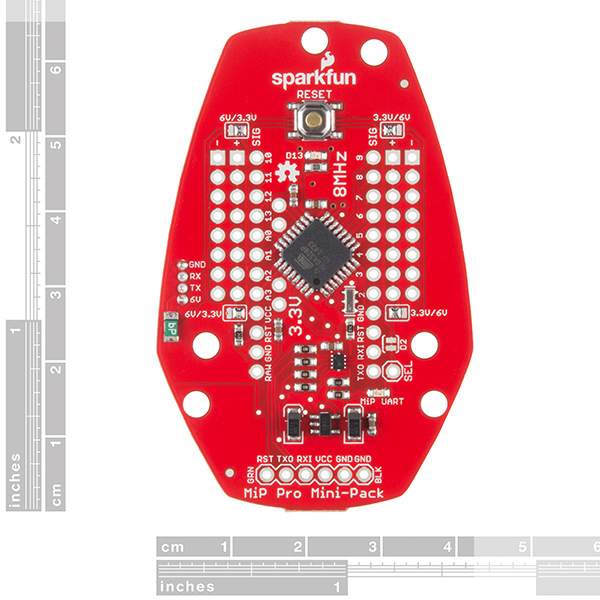 https://github.com/sparkfun/SparkFun_MiP_Arduino_Library Sorry for the delay and confusion. Do you have a list of all the sounds? I was just editing the code to go through the sounds, some are hard to define what the sound is. When are the libraries going to be posted on Githib? I am thinking about buying this but would like to know what the whole command set looks like first. One of the things I'd like to do with the MIP is articulate the arms. The arm sockets look like they can accommodate small pancake type steppers or DC motors. If I get get ones powerful enough or get them geared that way, I can at least get the arms moving at the shoulders. Is that possible? It seems that there are plenty of PWM channels available. Yo, don't be whiny please. Invest that time/energy in googling! Now help build out that library and empower others!!! All orders are delayed 3 weeks while SparkFun moves into their new new building. so what's up with the github arduino libraries? And why a 8 mhz arduino? and 3.3 v? just curiousâ¦.. Sorry for the confusion, we are re organizing our repositories to better fit with the new Arduino Library manager. The should be fixed by the end of the day. Thanks, the tutorial link is still wrong. I got mine together and working tonight. I like how the code was already on it. Its walking around burping in the kitchen. Worked fine, except that the fitment is not flush(due to some fancy interlocking on the MiP Battery compartment) without sanding. The example code loaded just fine, and even the standup function(from the MiP's documented protocol) worked fine. Serial mux is useful for debugging, once you know how it works(change mux control input with delay before reading/writing). 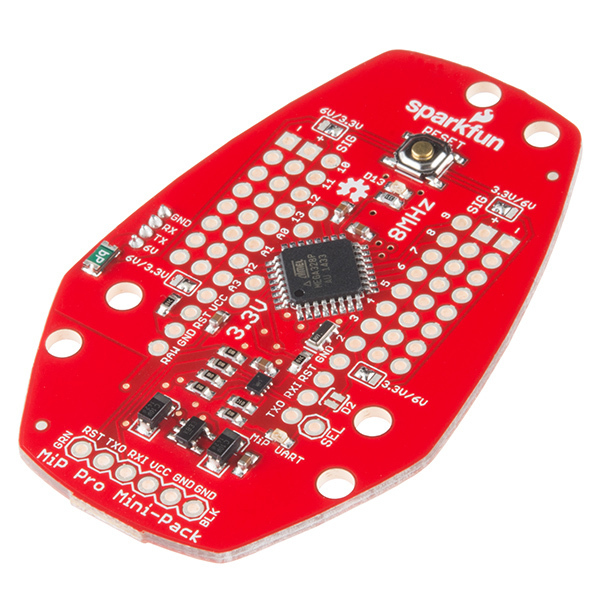 Wish the Sparkfun's github library had more MiP functions implemented. I have added the headers. The board refused my attempt to use USBASP to program a bootloader. Still cannot get the board to do anything. Very disappointed. I have lots of other Atmel328, Arduino boards that I do not have problems with. Right now this board is useless junk. Have not done much with this yet. I soldered a header to the main communications location and tried to download code to it. The download failed. I think the problem is that the bootloader is not running the baudrate that Arduino expects. Without the six pin header pattern for attaching a USB dongle I have to wait until I solder headers in to give it a new bootloader. It does seem to run (led blinks). Worked right away with my usb to ftdi cable. Already contributing to MiP library and having fun making my kids robot misbehave.